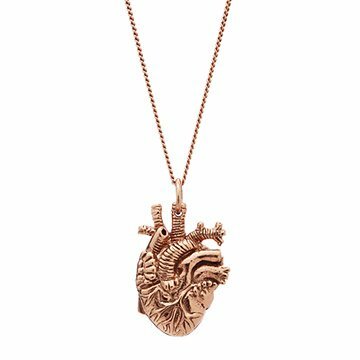 This anatomical accessory lays bare the mysterious inner workings of our most amorous organ: the heart. This petite accessory lays bare the mysterious shape of our most amorous organ: the heart. Justine Brooks found her inspiration for this anatomically correct piece in her husband's profession as an ER doctor. Foregoing the typical Valentine shape, her delicate pendant puts the heart's true form on display for all to admire. Each piece is hand-cast in bronze then plated with rose gold. Handmade in Canada. Justine Brooks' passion for researching stones, metal techniques, and design is best evidenced by her nine-month solo trip throughout the Middle East, East Africa, and Asia. The result is a collection that boasts an intriguing blend of East and West, as she believes the ability to explore other cultures is the greatest gift of life. Also a gifted metalsmith, Justine creates a signature look of raw, natural, and precious qualities. She took this aesthetic and ran with it, establishing her own business in 2005. Wipe gently with a polishing cloth. This rose gold piece contains copper, which gives the necklace its lovely rose color. Rose gold will take on a patina over time. Avoid wearing in the shower or while swimming. This is a beautiful necklace. I gave it to my friend for her birthday a month ago and it was perfect. After a month of wear, the gold has started to come off. The chain is completely dark and the heart is darkened around the areas most in contact with skin. It's still beautiful and I knew it was bronze underneath. I just thought it was good to know how fragile the gold color actually is. It has perfect meaning. I had breast cancer and suffer from heart problems from chemo. I am now 6 years cancer free, but my family has been by me every step of the way. I have 3 sons and 1 daughter in law. She has been amazing. Saw this on her Christmas list and knew it would hold tremendous meaning given from me. She holds my heart, and that is special. She absolutely loved it! Such detail and quality in the workmanship...beautiful! My wife loved the pendant and it looks great on her. Only con was that the necklace it came on was way too long. I am a cardiothoracic surgery nurse in the OR and received this from my brother and sister-in-law for Christmas. I wear it to work and get comments on it all the time. It's such a unique piece that it is noticeable! The rose gold matches my wedding band and engagement ring too, so it's great for everyday wear. I have been looking at this necklace for more than a year trying to decide based on reviews whether or not to buy it. I was recently on the site and when I saw that it was offered in rose gold I knew it was time to make the plunge. I just got my order tonight and I LOVE IT!!!!! It is more than I thought it would be. I was worried it would be too much in your face but it is the total opposite of what I thought. I highly recommend this piece of jewelry especially anyone in the medical/nursing profession. It will definitely be a topic of conversation at work. LOVE LOVE LOVE it!